'I'm alive': Cyclists nearly hit on Manitoba highway on last leg of trek from B.C. A pair of cyclists travelling from Vancouver Island to Manitoba are lucky to be alive after they were nearly run over by an SUV just a few kilometres away from their final destination on Tuesday. 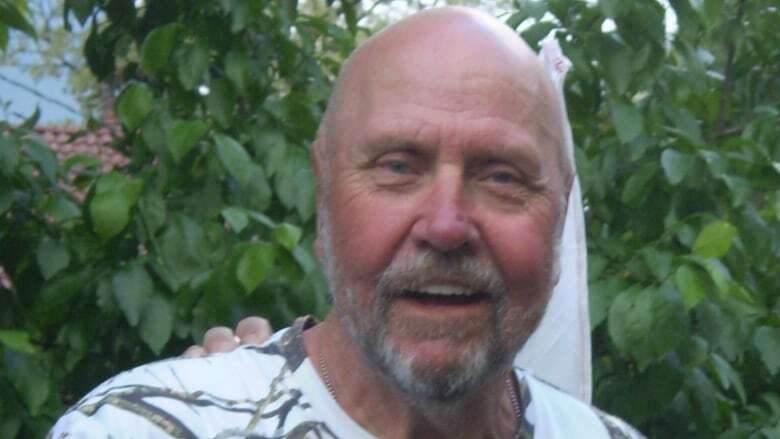 Ray Harris, 68, and his friend left Victoria May 24, both riding recumbent tricycles. After surviving the roughly 2,500-kilometre trek from B.C., the pair were on the highway just 15 kilometres out of Beausejour, Man. — the end of their western Canadian journey — when Harris happened to look in his rearview mirror. "All I saw was a grill and a black-coloured SUV right in my mirror," he told CBC News Wednesday. "If I had have stayed in the straight line that I was going on the vehicle would have gone over the top of the trailer and hit me, dead on." Harris immediately turned his trike toward the ditch and got out of the way just in the nick of time, but the SUV smashed into the trailer he was pulling behind him. He says the noise of the crash is the only thing that alerted his friend, who was riding ahead of him, to get out of the way. "He heard the collision and I think [the SUV] just passed him very closely, but the vehicle never stopped — it was a hit and run," said Harris, who wasn't able to get the vehicle's plate number. "I just had time to react as best I could. I'm really disappointed that the person didn't stop and I'm really disappointed I wasn't able to complete [the trip], but I'm alive." Harris and his 70-year-old friend decided to make the trip after the pair met two years ago at the MS Bike ride from Winnipeg to Gimli, Man., an annual event which raises money for multiple sclerosis research. Harris, who is originally from Nanaimo, B.C., said he was interested in cycling back home, and his new friend said that trip was something he'd wanted to do for years. They decided to reverse the trip — travelling from B.C. to Manitoba — and started planning. They chose to end their trip at his friend's home town of Beausejour, 49 kilometres northeast of Winnipeg and roughly halfway across the country. They hadn't planned on raising money during their trip, but after people started asking what they were raising money for, they decided to use the trek to fundraise for the MS Ride. "We're just two old guys trying to relive a little of our youth — that's how it started out," laughed Harris, who admits the trip was more than a little gruelling at times. "Anyone who says Saskatchewan is flat is out of their mind. And the Rockies hurt — they're really fun coming down but they're terrible going up." Harris says he wasn't seriously injured in the crash, although his trailer was destroyed and he's waiting for an estimate on the damage to his trike. After his first night of rest following the trip and the near miss on the road, he said it's too soon to say whether he'd do it again — but he isn't ruling it out. "Right now I'm a little sore," he said. "But it was really an amazing thing to do."